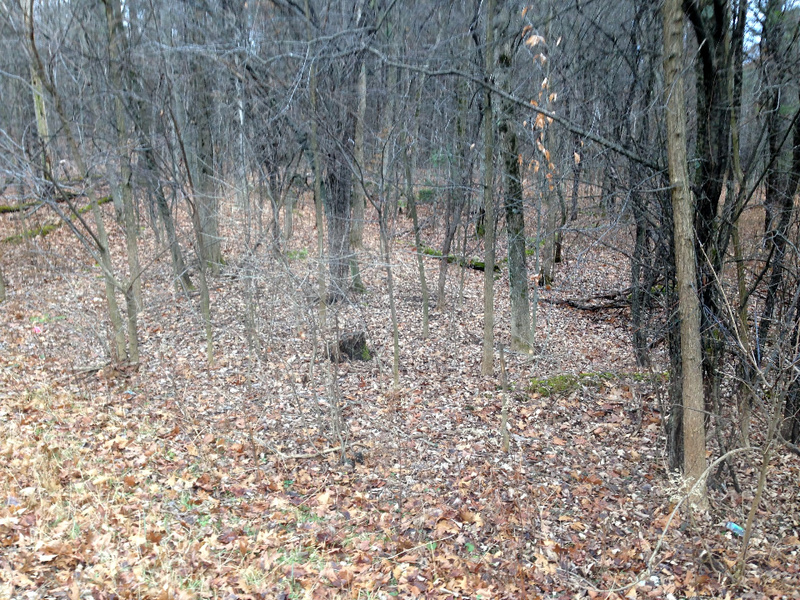 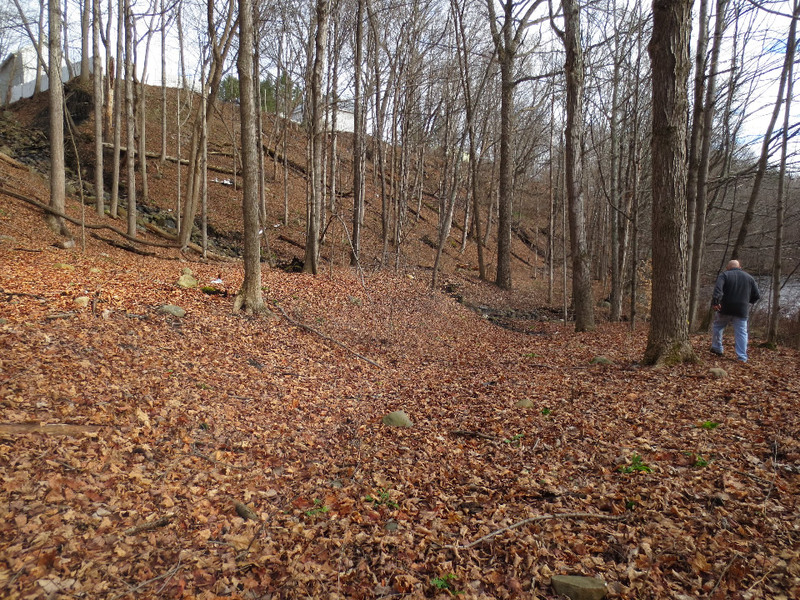 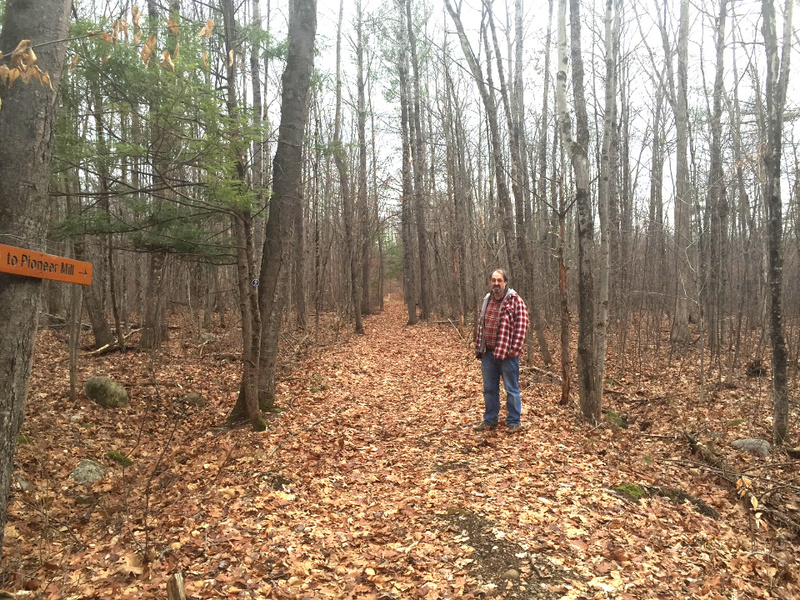 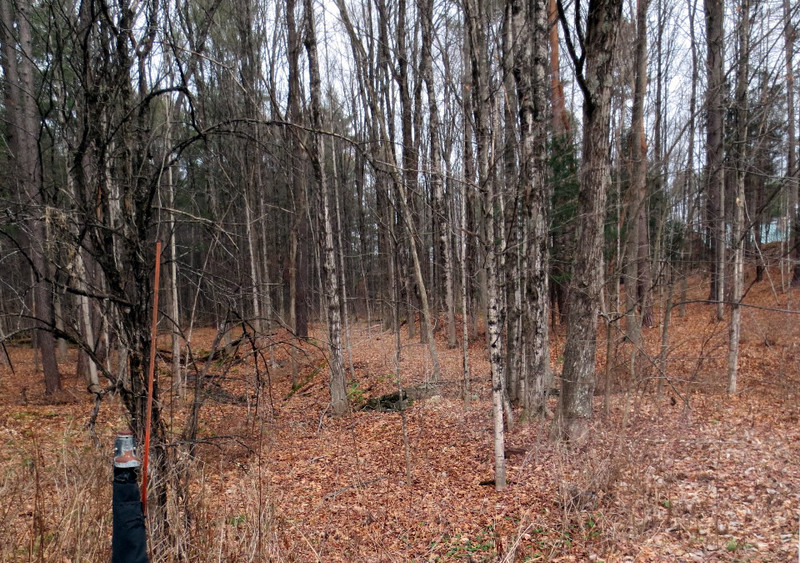 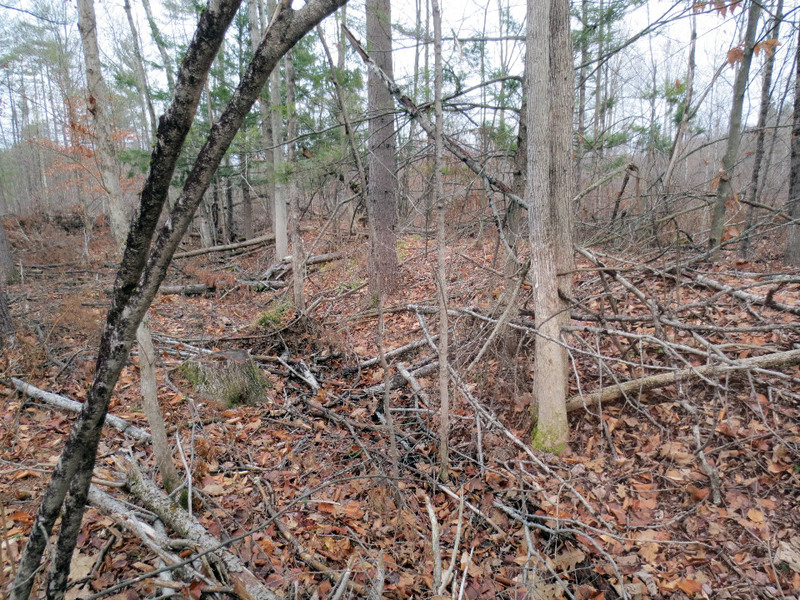 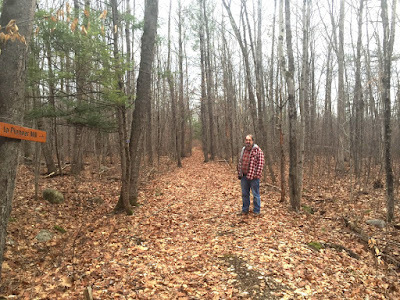 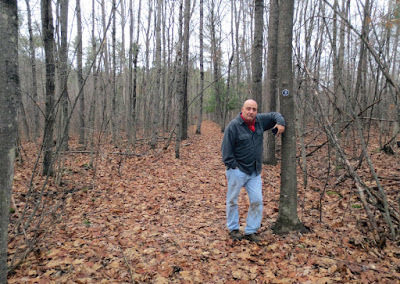 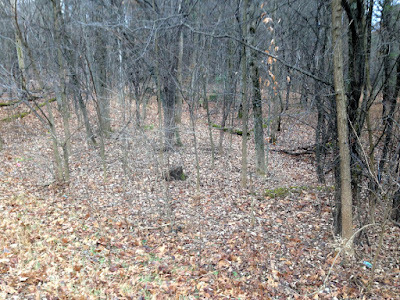 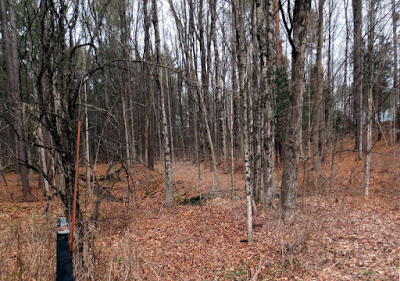 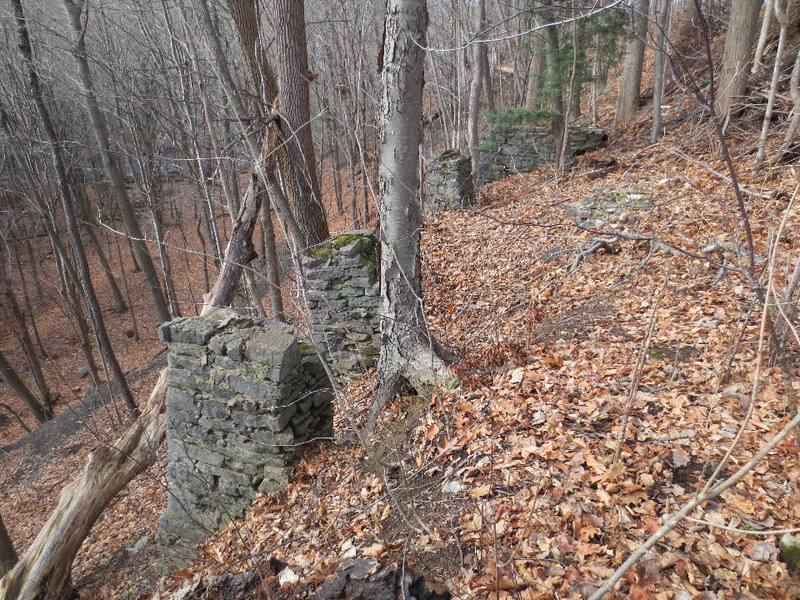 After leaving the Axe Mill site we continued northward. 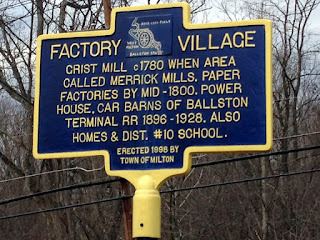 Our first stop was the County Farm Crossing. 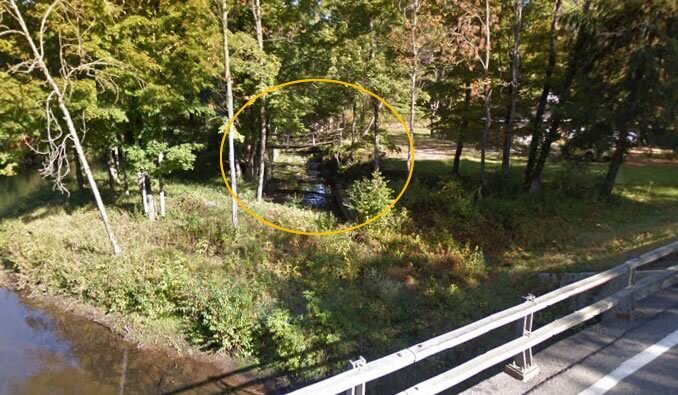 There used to be a road bridge here but it has been removed for quite a while. A short jaunt down the hill took us to the ROW. 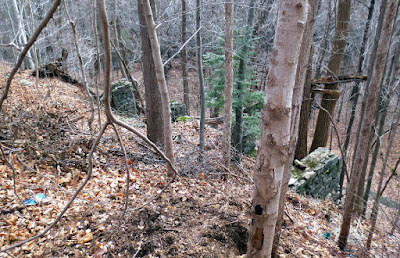 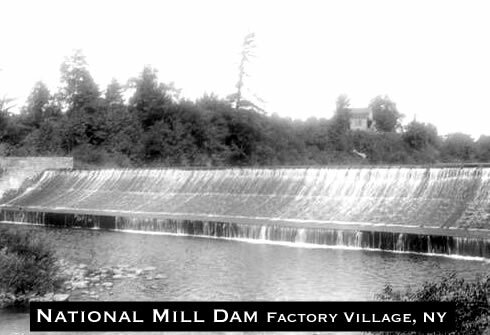 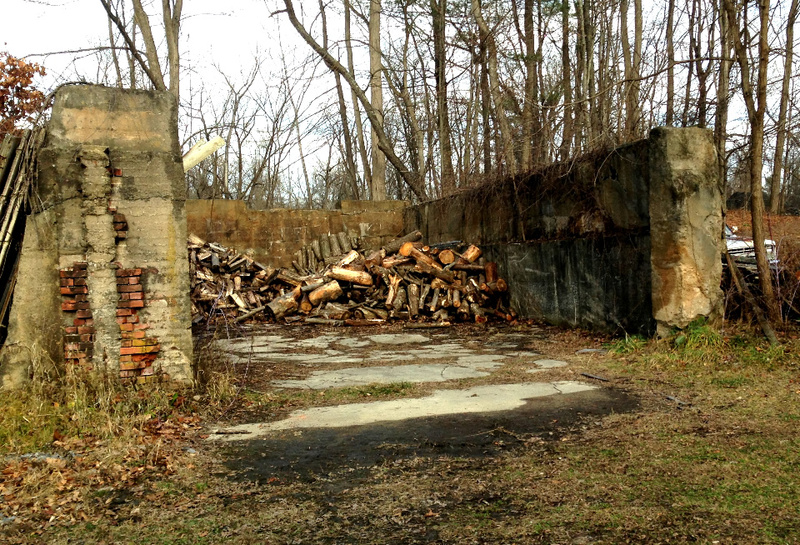 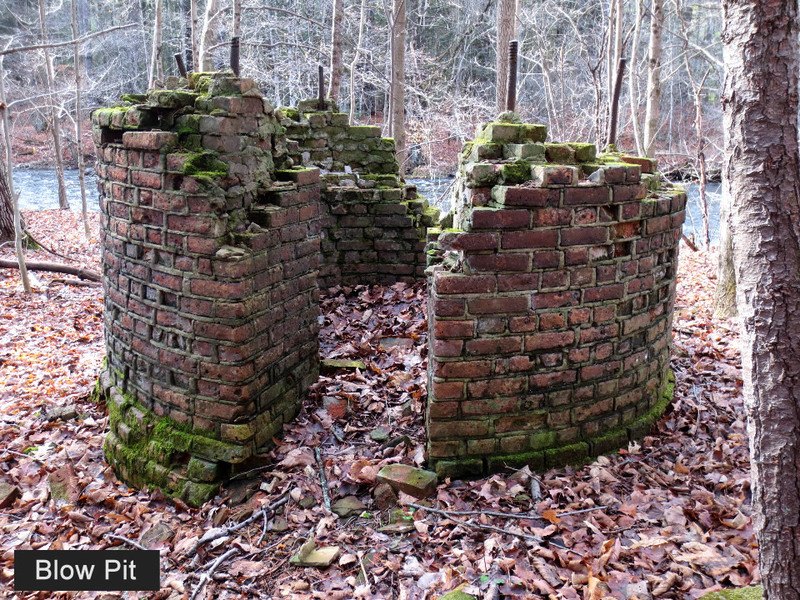 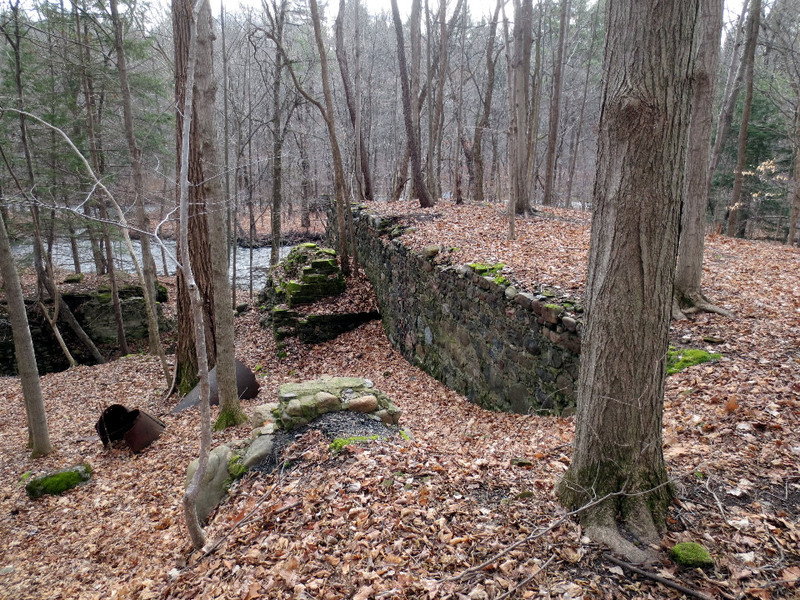 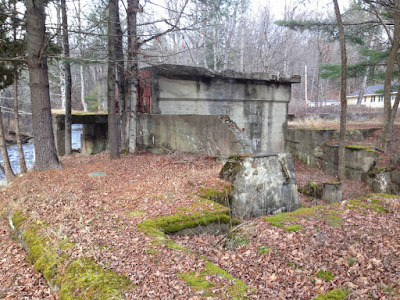 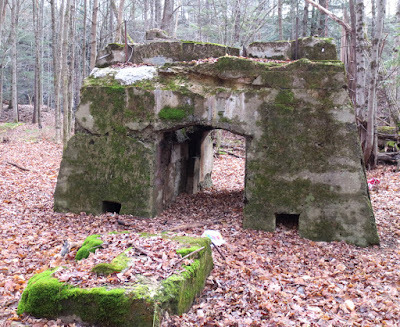 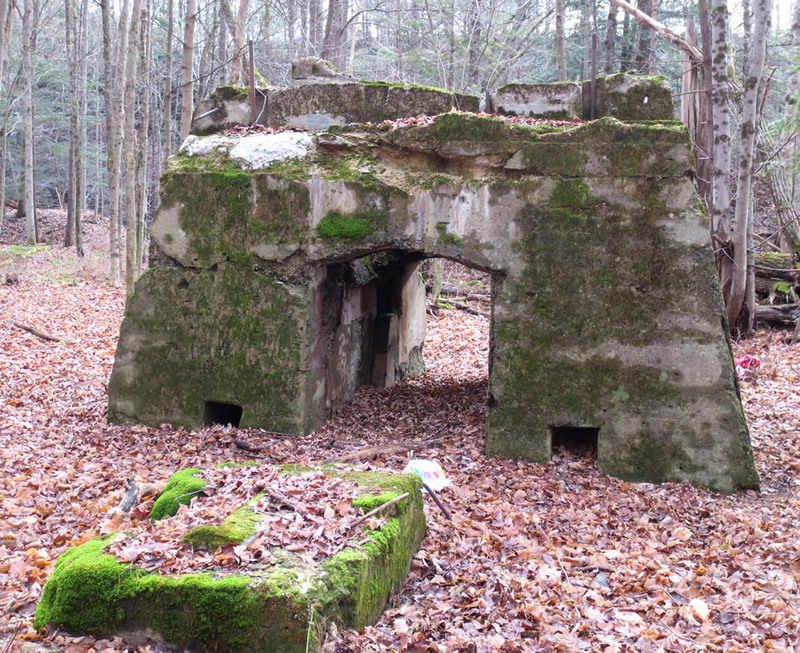 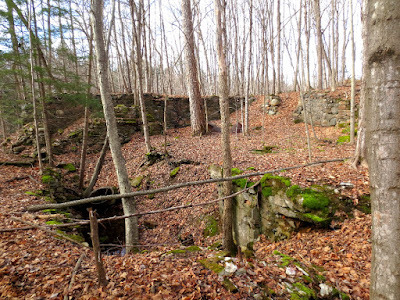 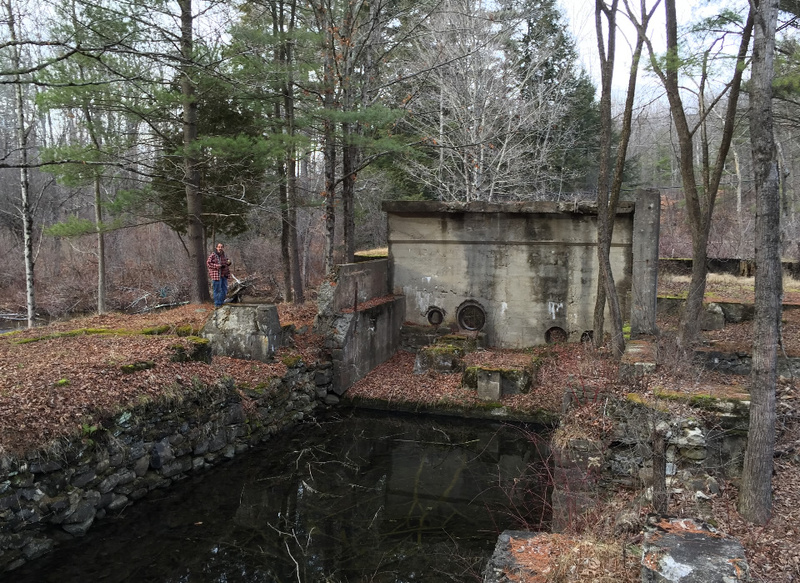 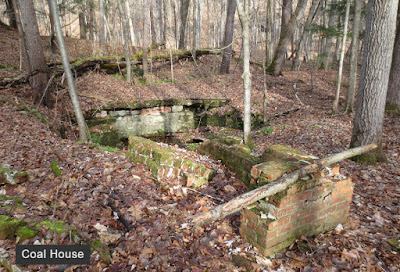 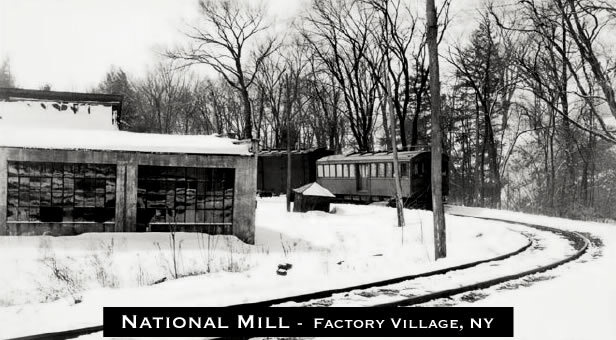 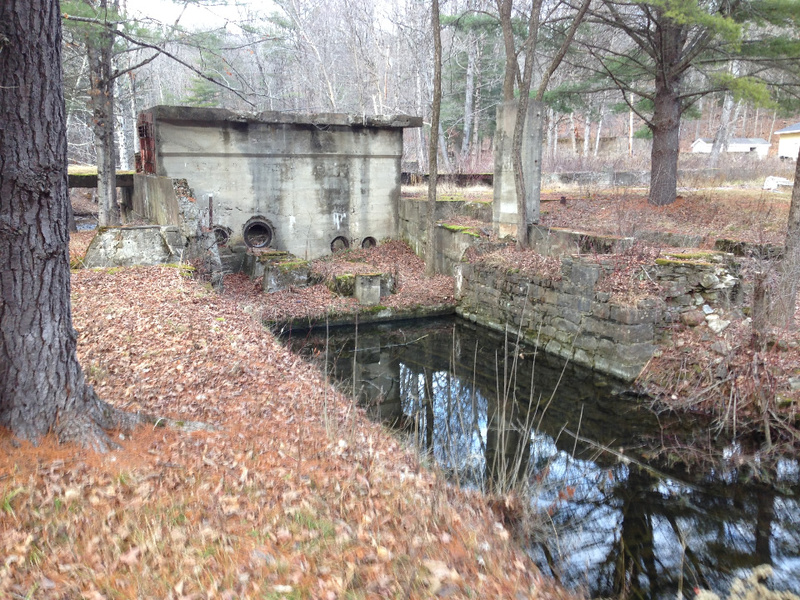 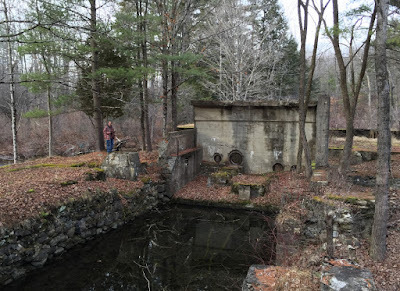 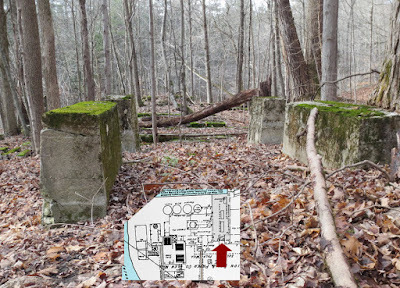 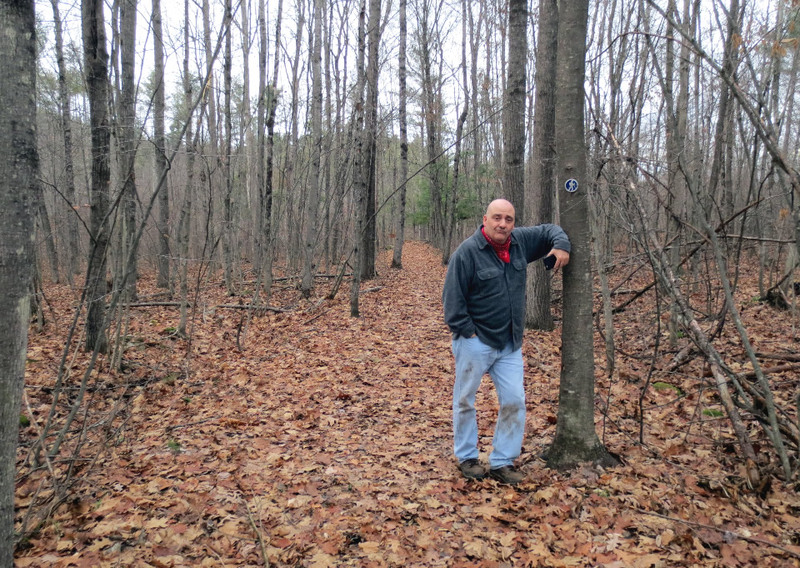 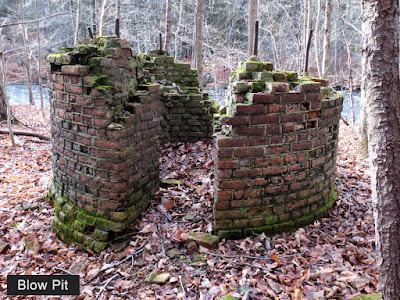 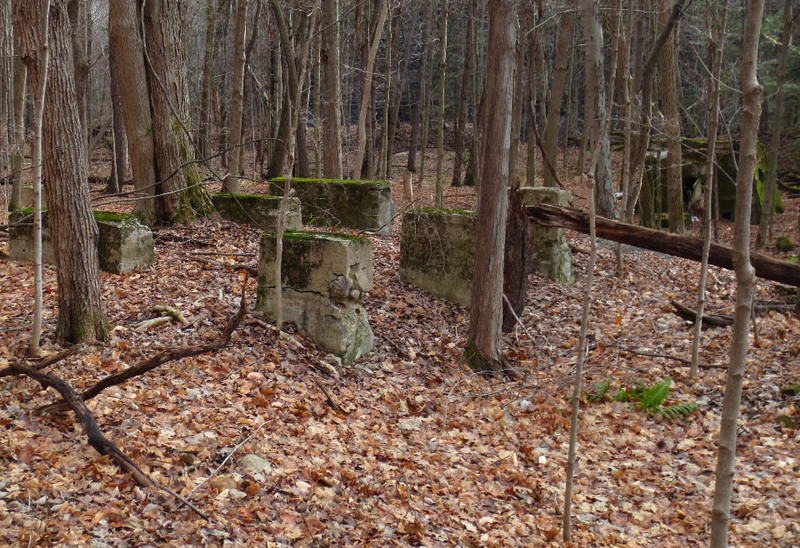 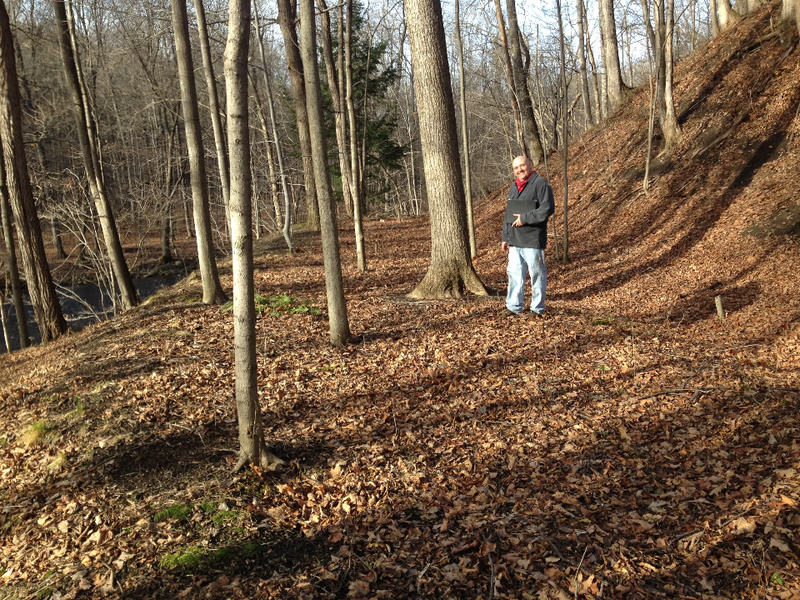 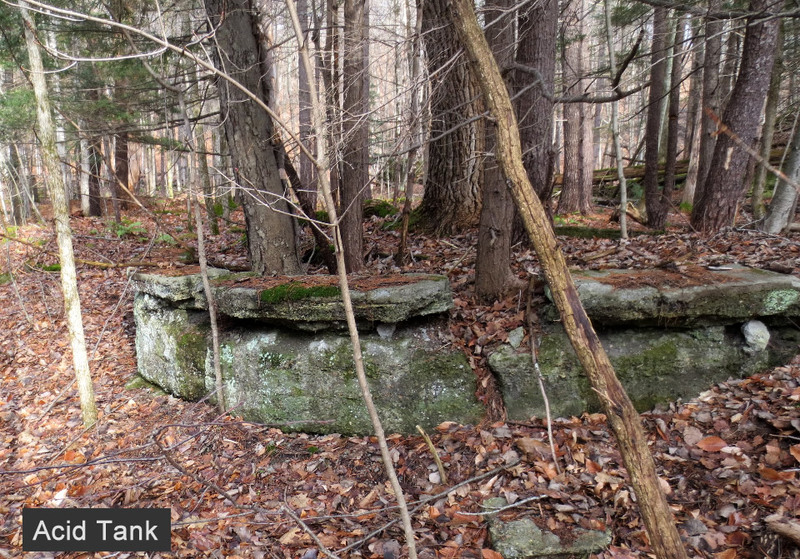 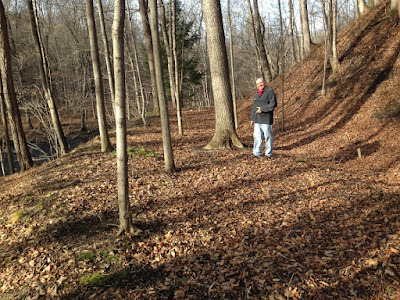 The National Mill remnants were located on private property so a thorough hiking exploration wasn't "in the cards". 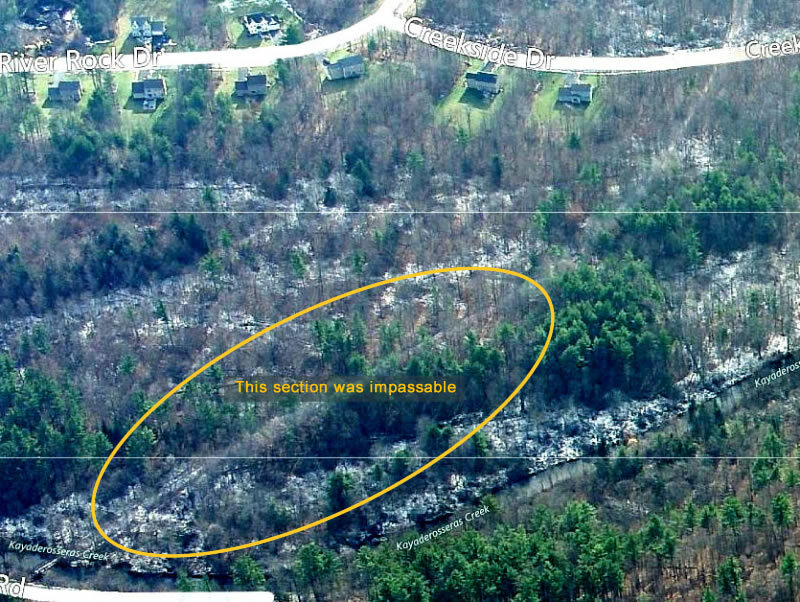 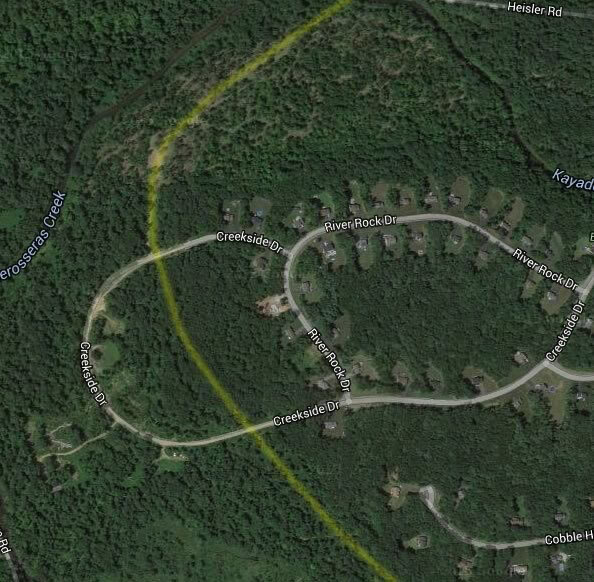 But there were a few mill remnants easily visible--even using Bing aerials. 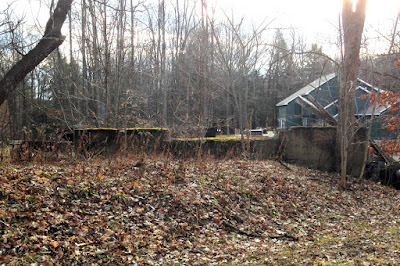 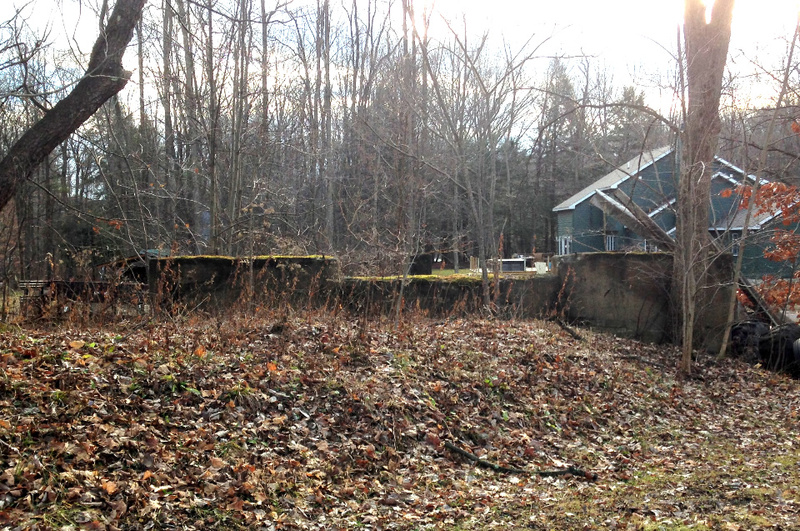 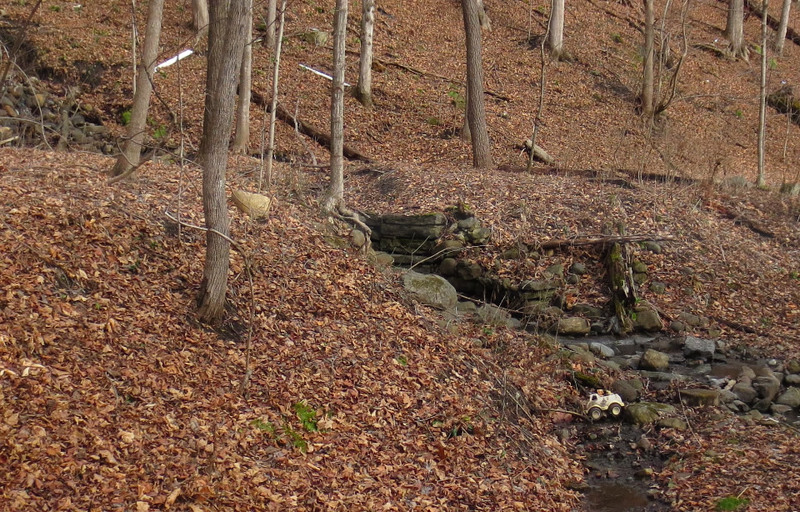 Sadly, we didn't get a chance to sniff out what appears to be the former dam across the creek. 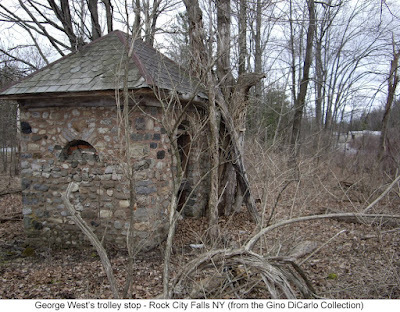 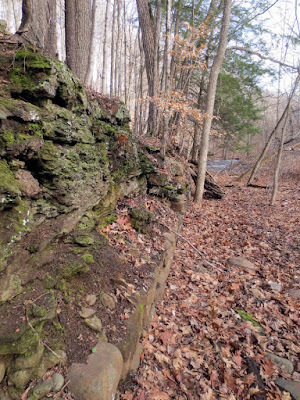 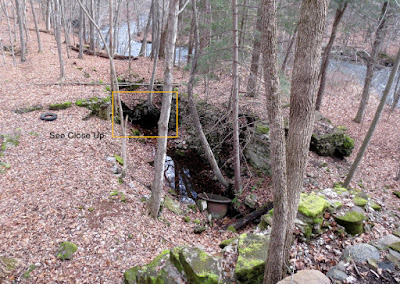 At the intersection of Rock City Falls Road and Sherman Road--at a designated Angler's spot--you can see the Eagle Mill remnants. 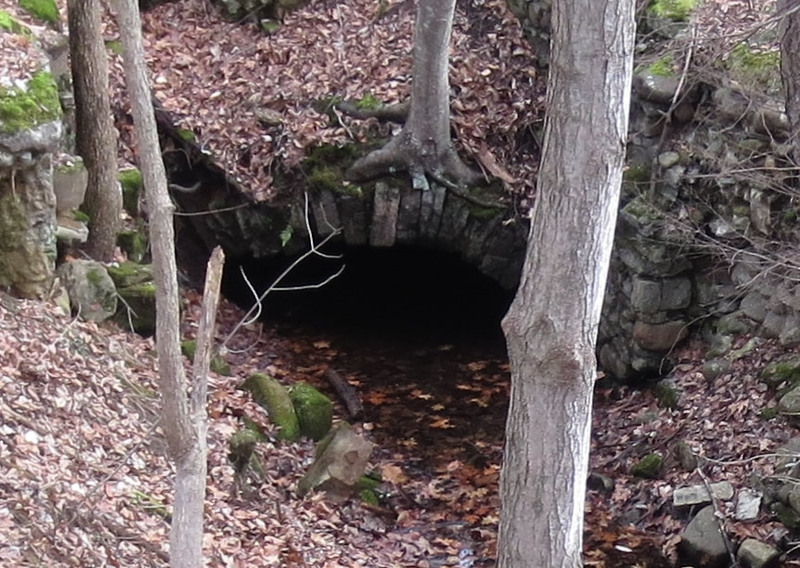 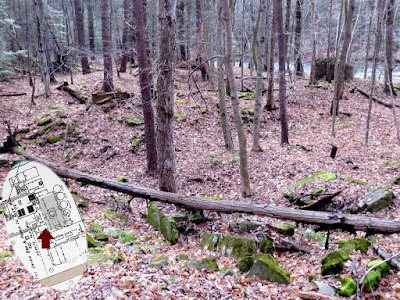 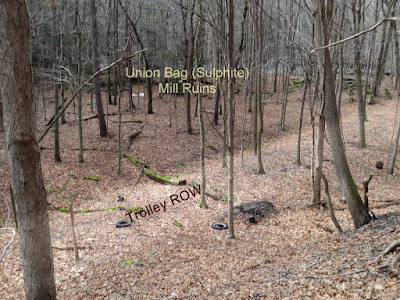 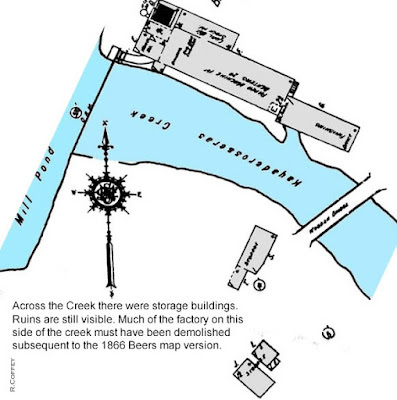 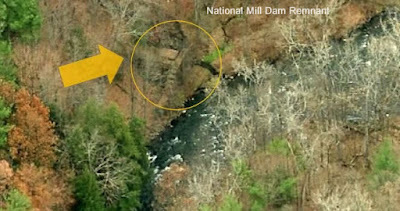 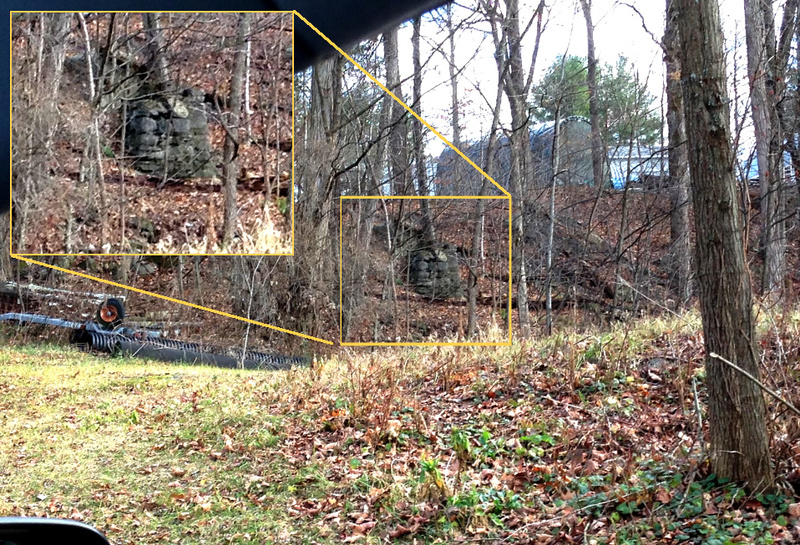 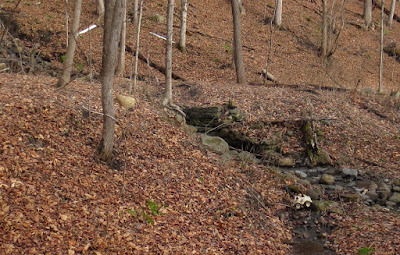 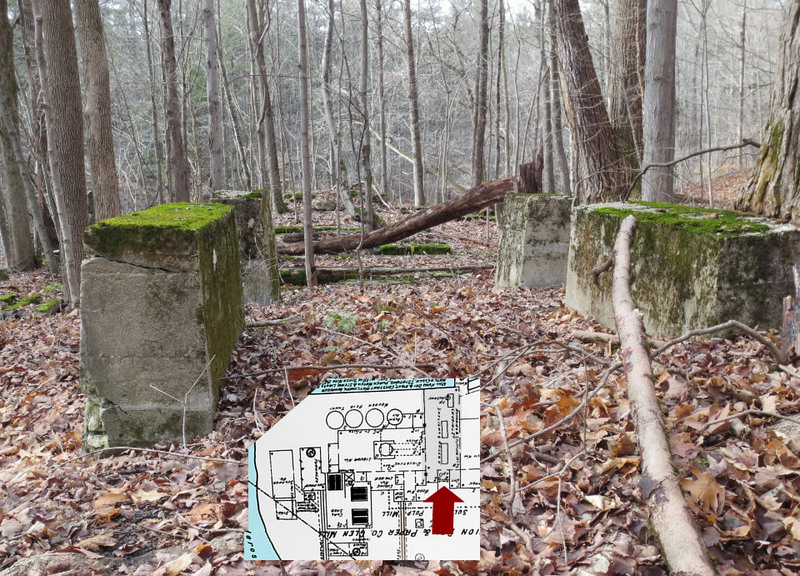 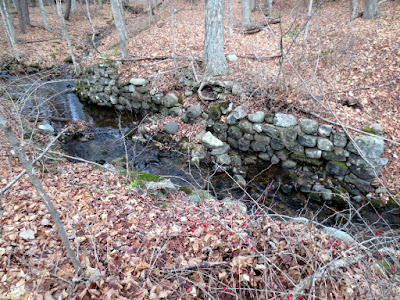 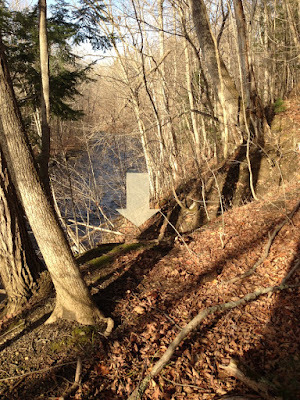 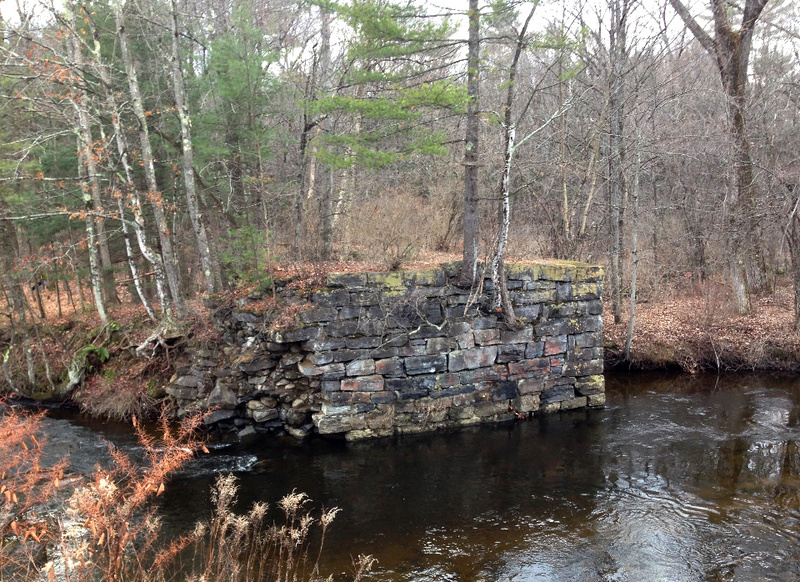 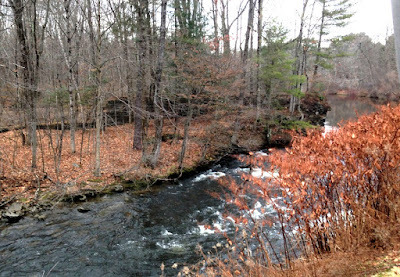 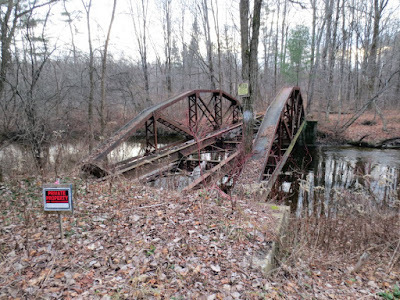 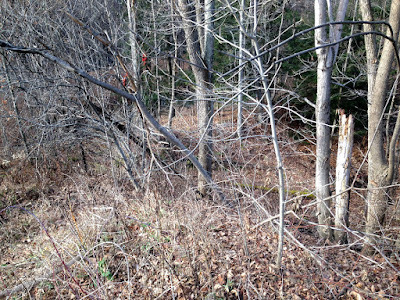 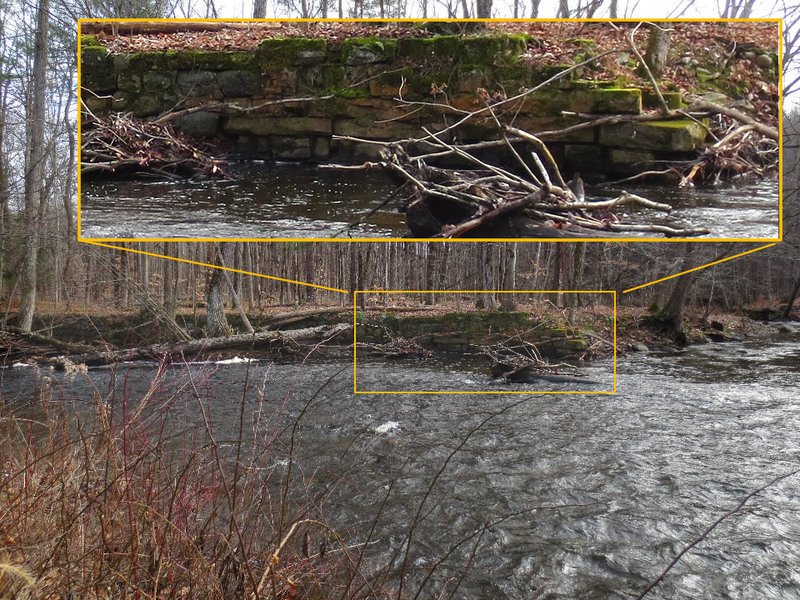 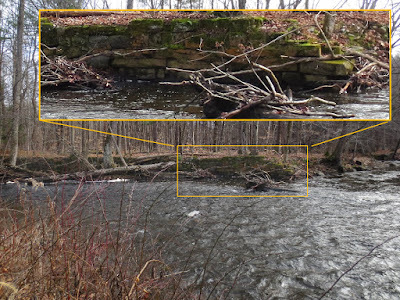 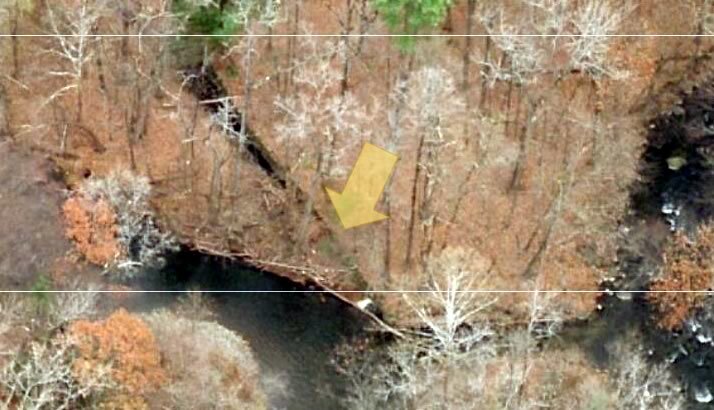 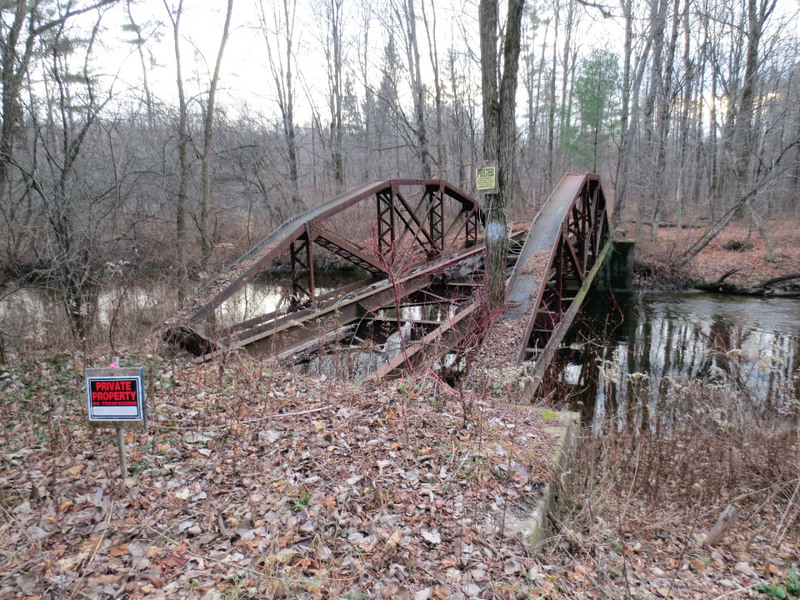 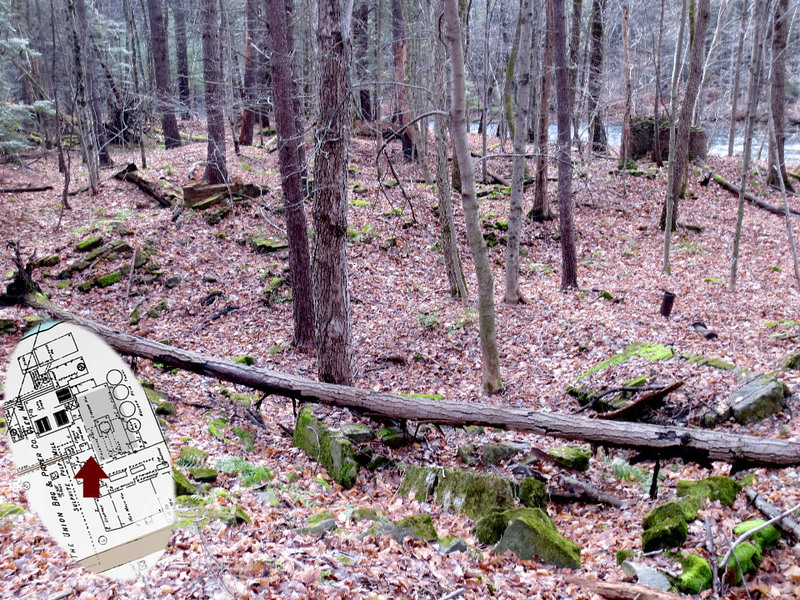 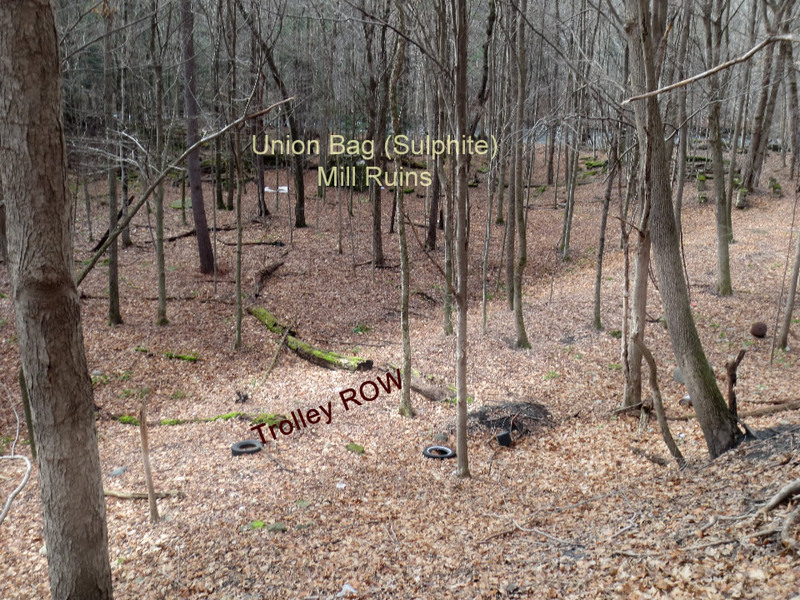 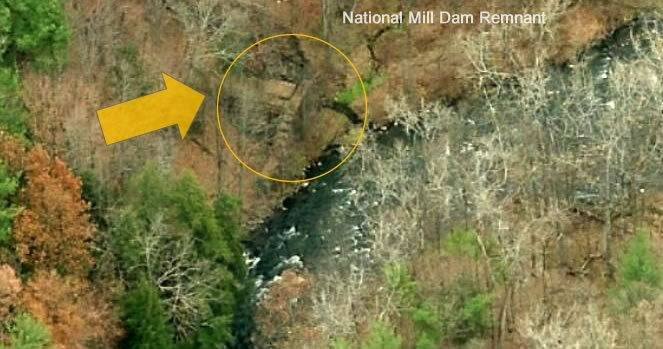 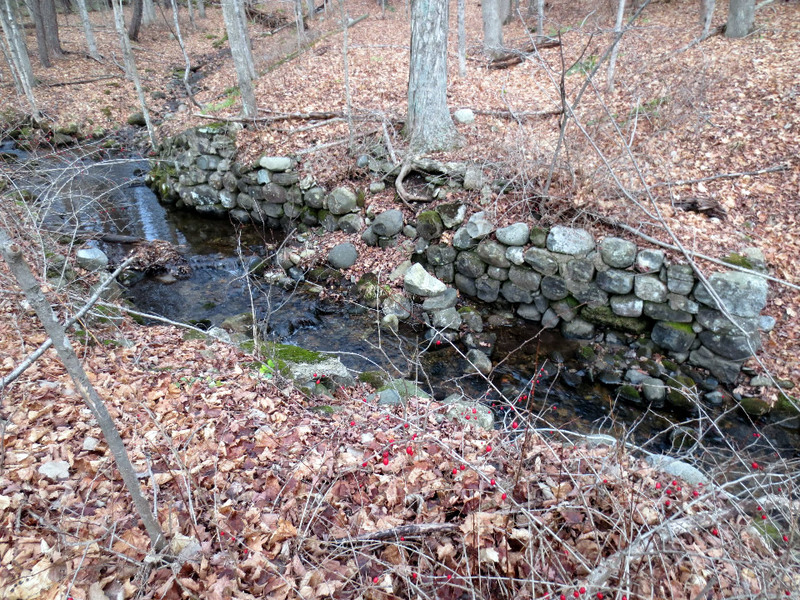 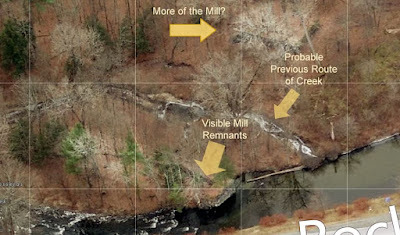 What's perplexing about this spot is that it appears the creek has been rerouted to the east side of the mill subsequent to the mill's abandonment. 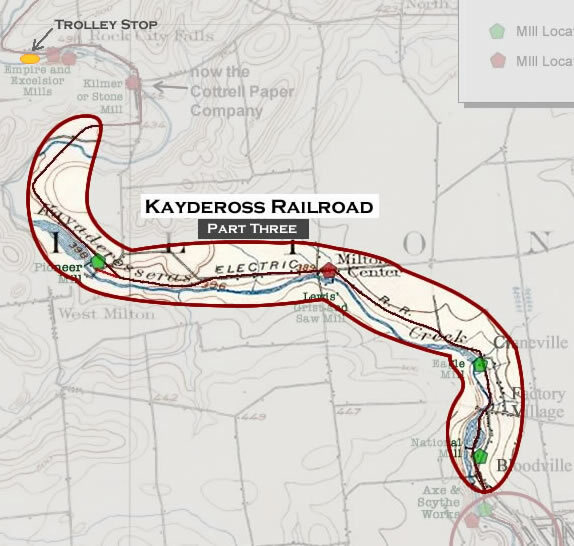 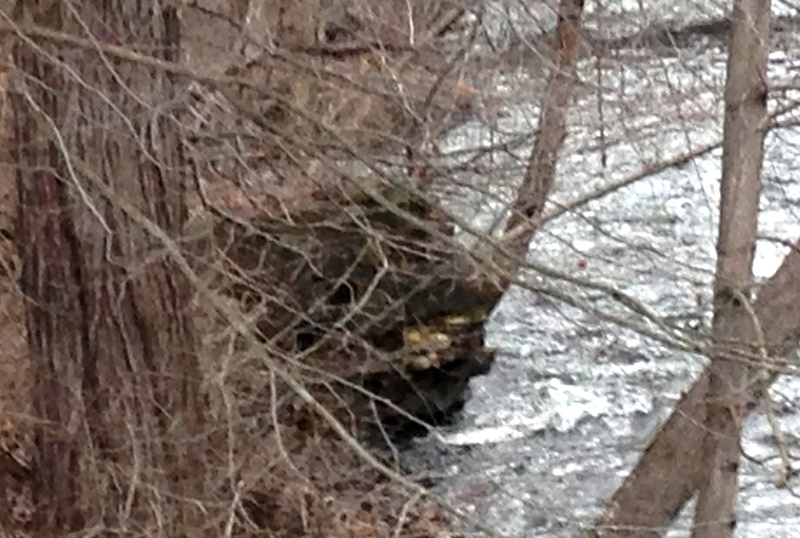 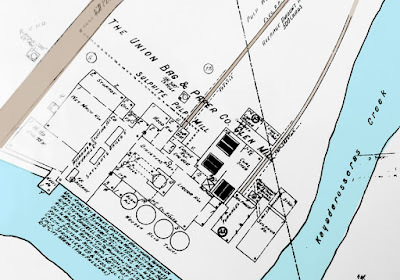 The Valuation Map showed the main flow of the creek on the west side of the mill! 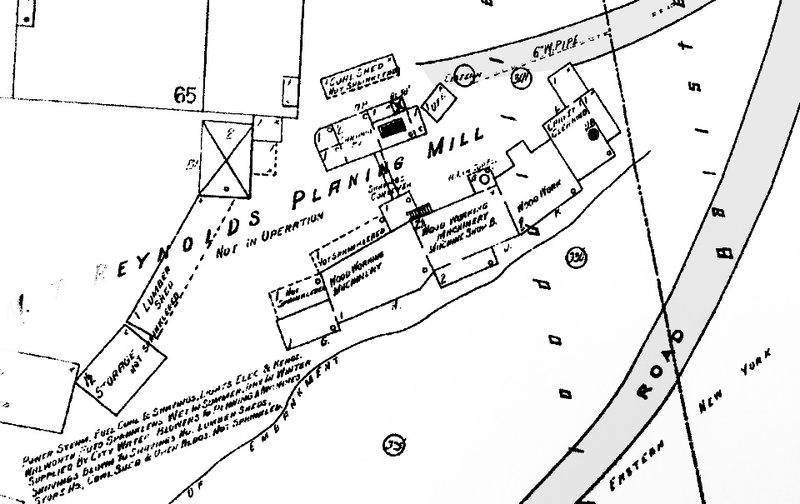 and the Saratoga Springs Public Library History Room. 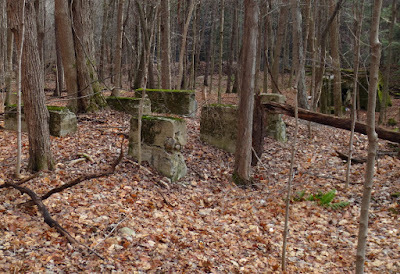 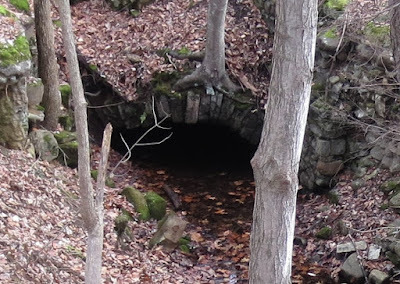 There was a mysterious ruin lurking in the woods across the creek as well. 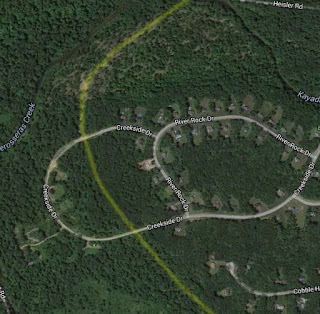 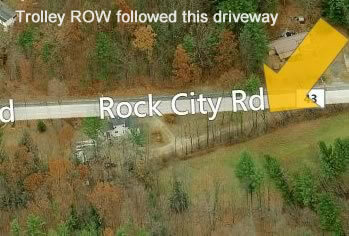 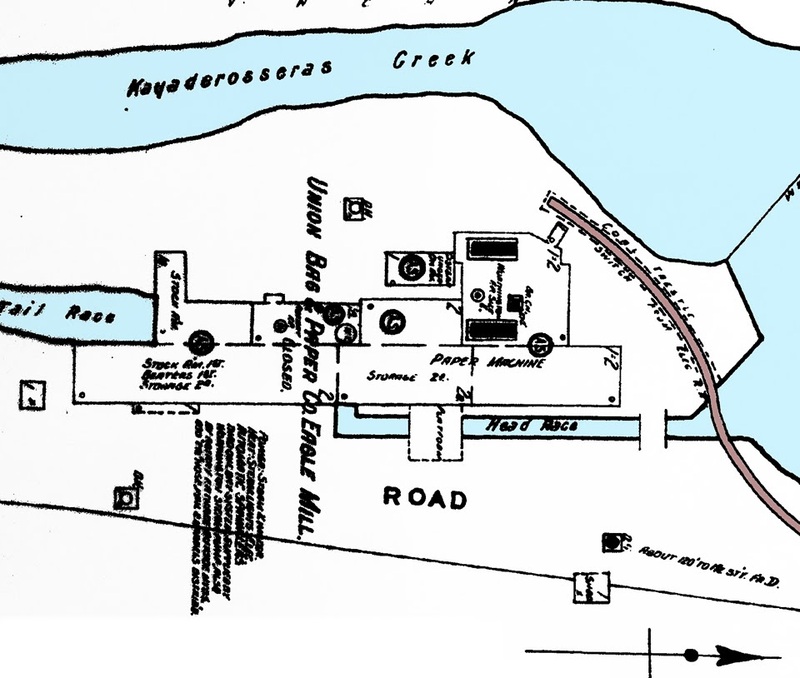 Following the Trolley ROW on old maps or Bing or Google aerials indicates the ROW veered from the road at this driveway. The Pioneer Mill in West Milton was a spooky spot for me. 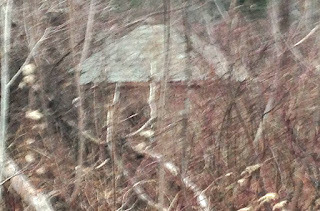 The weather was darkening with a sky full of nasty gray clouds and it appeared (although we weren't sure) that someone lived on the grounds. I hastily took a few shots as Gino scoffed at my paranoia. 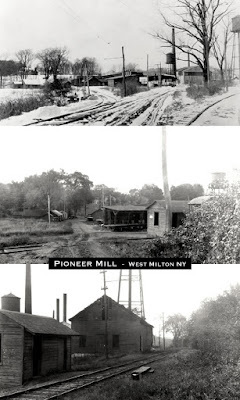 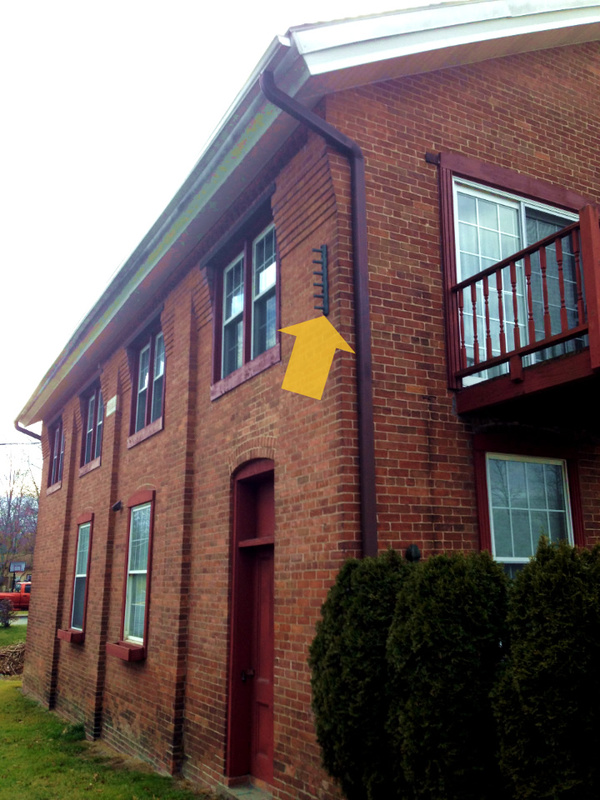 Right up the road about 50 ft or so from the Pioneer Mill remnants was the mainline ROW. 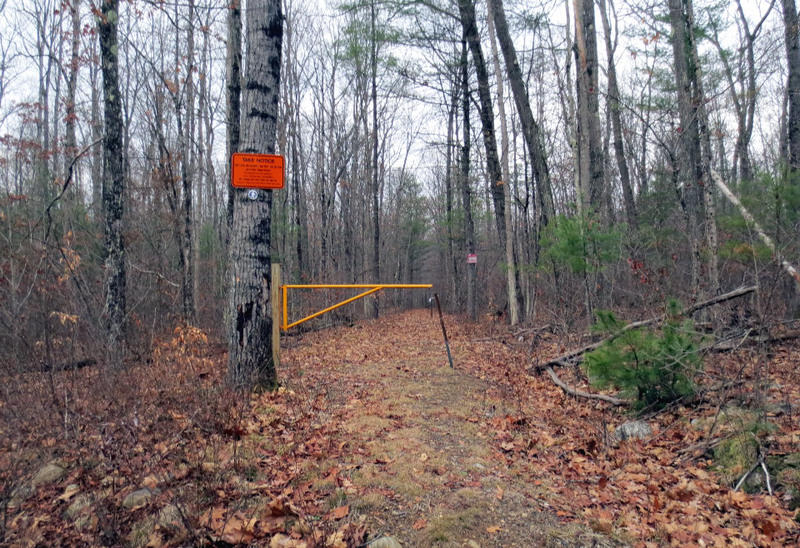 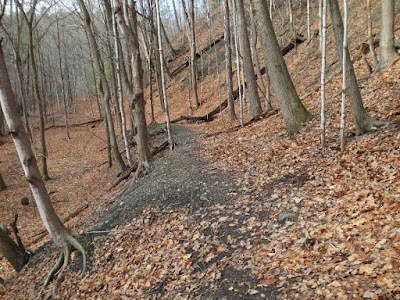 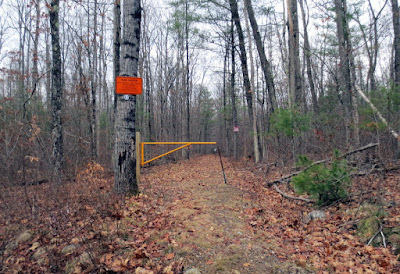 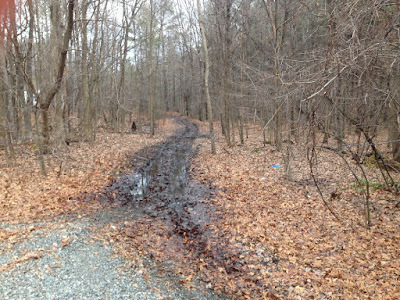 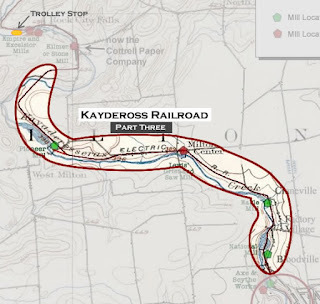 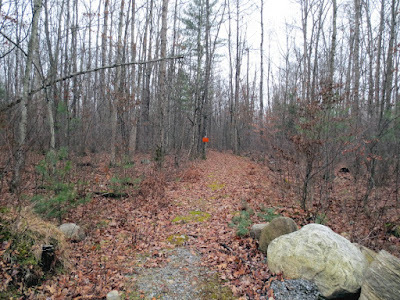 This has been designated as the Blue Trail (Trail Map >). 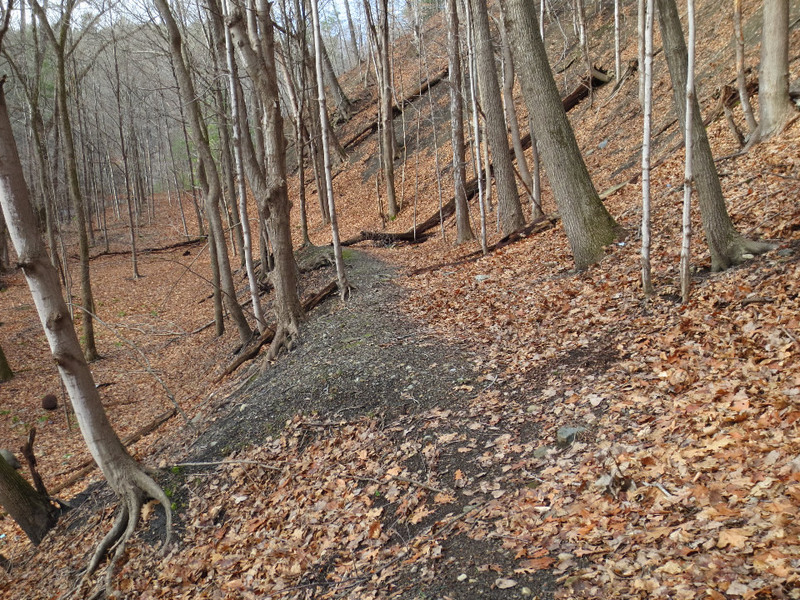 I plan on returning in the summer months to mountain bike it. 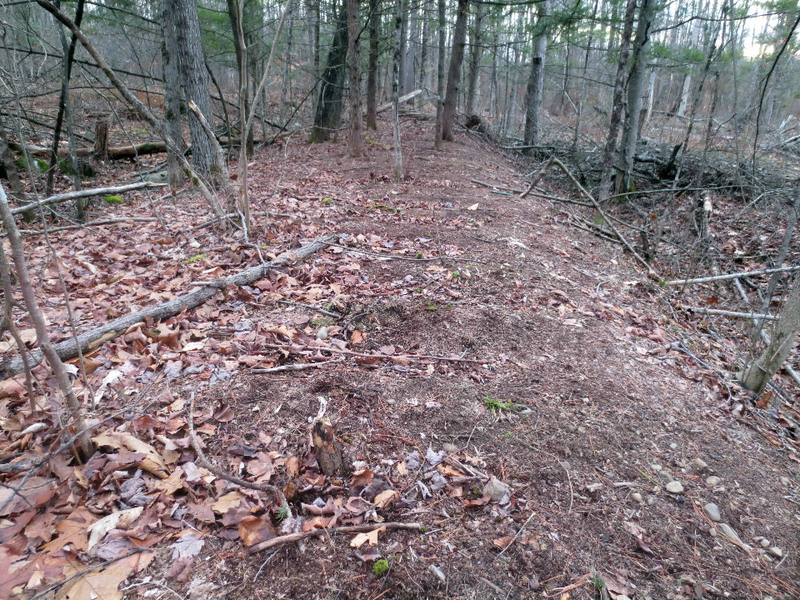 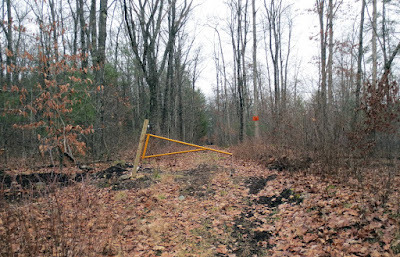 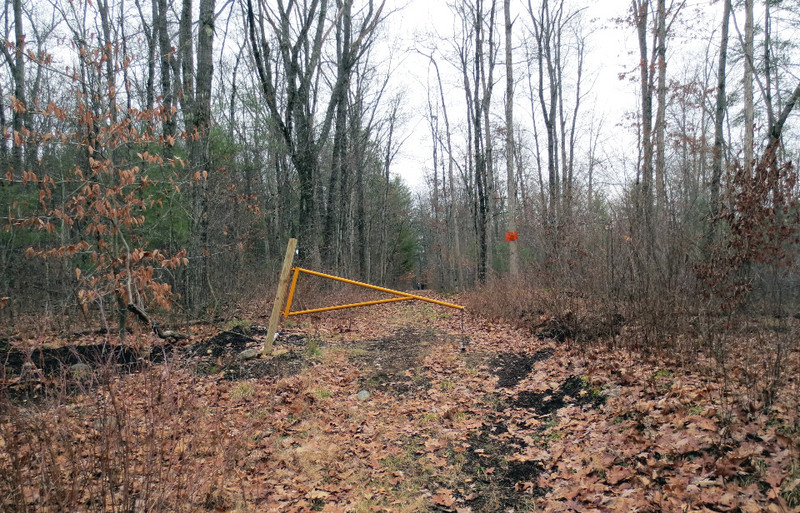 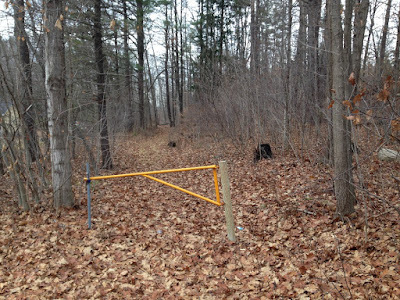 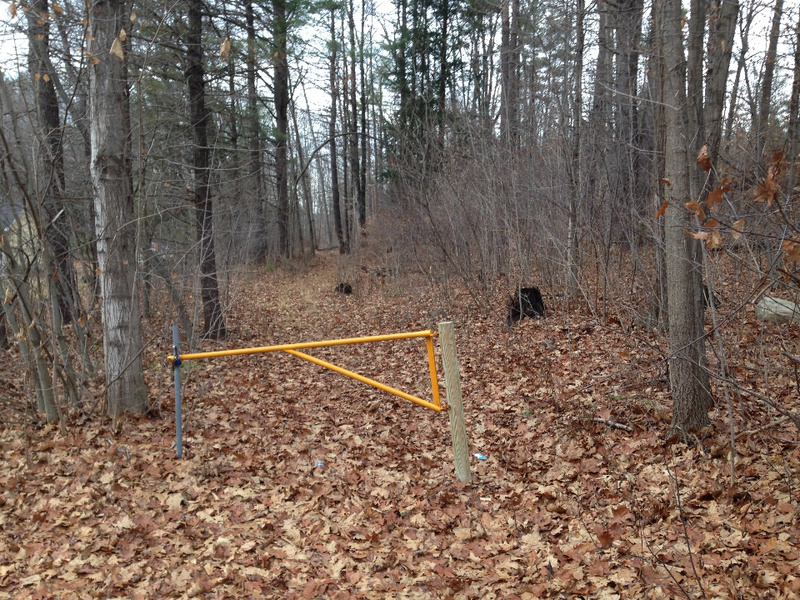 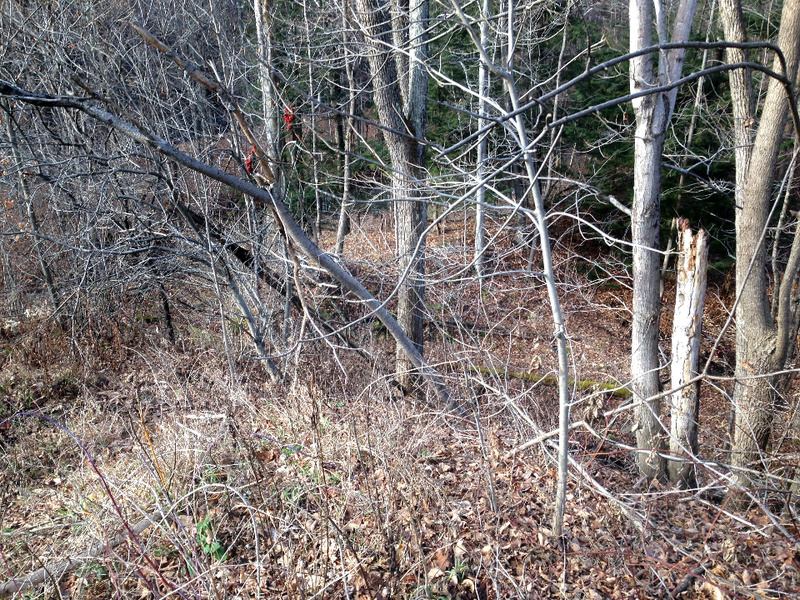 A bit further up the road, a housing development has been started and the trail (ROW) runs through it. 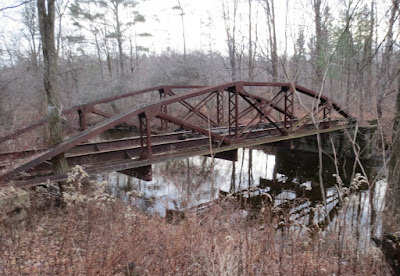 It was getting late in the day and increasingly darker so the last spot we explored was the trolley bridge on Heisler Road. 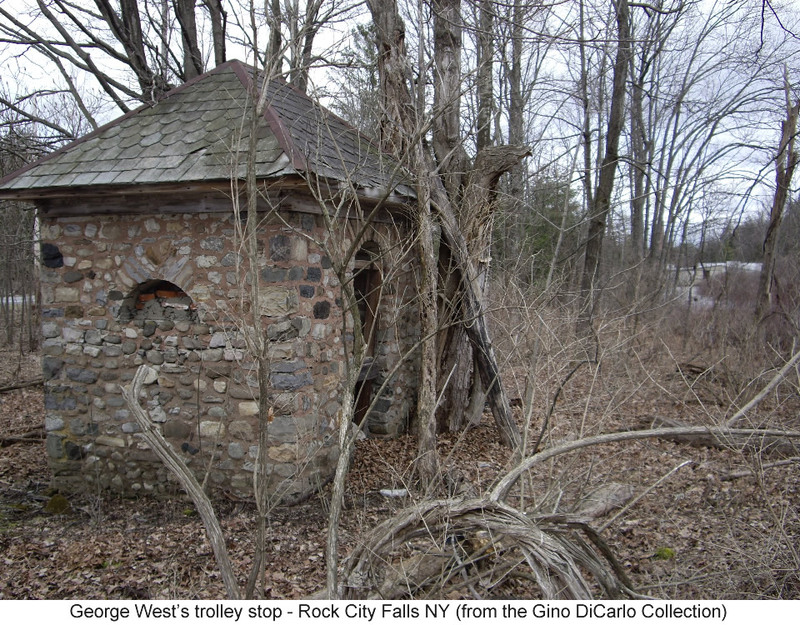 The Rock City Falls mills and whatever can found up at Middlegrove will have to wait for another trek but Gino directed me briefly to the trolley stop. 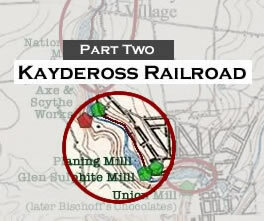 After a somewhat disappointing dead end on the ROW detailed in Part One, we were soon amply rewarded at our next stop. 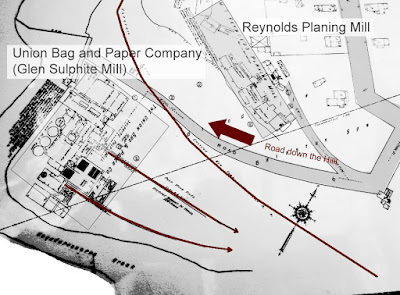 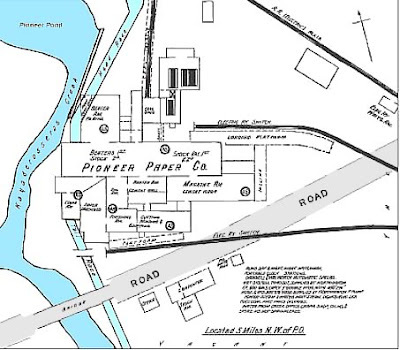 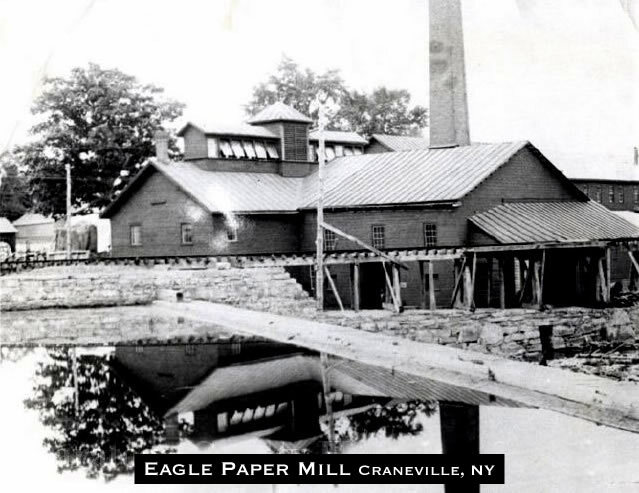 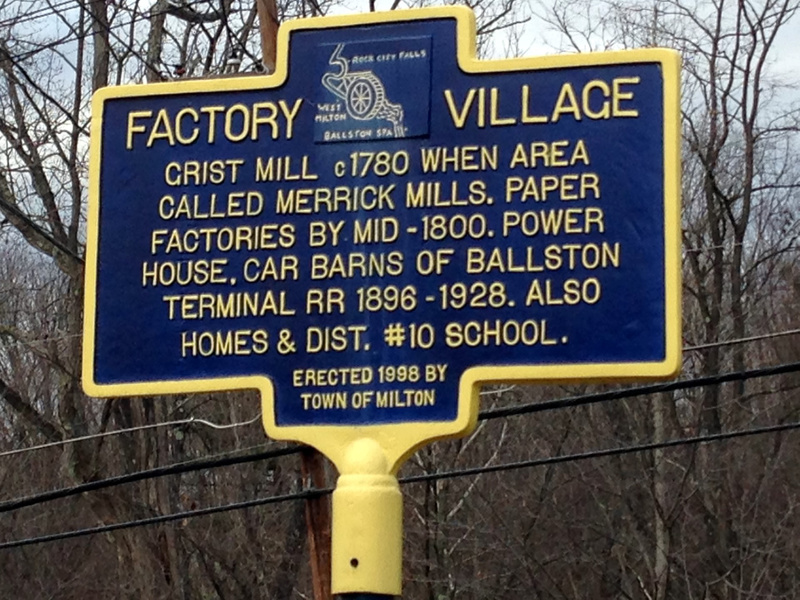 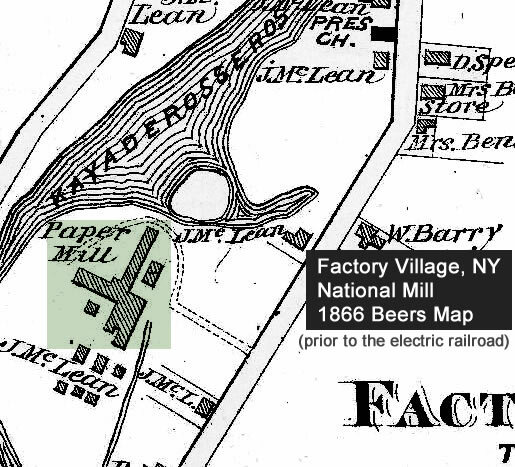 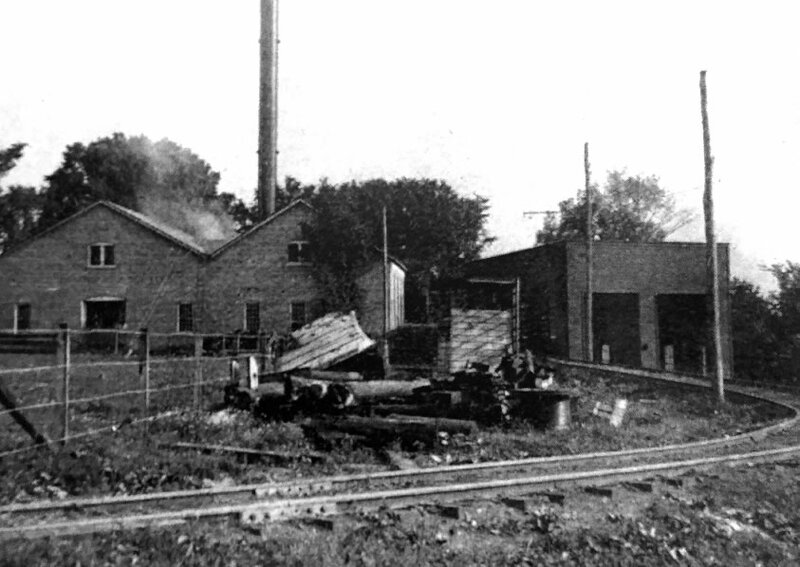 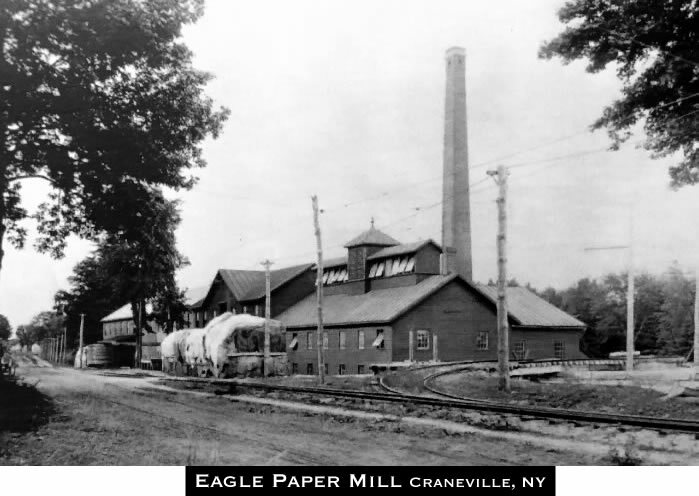 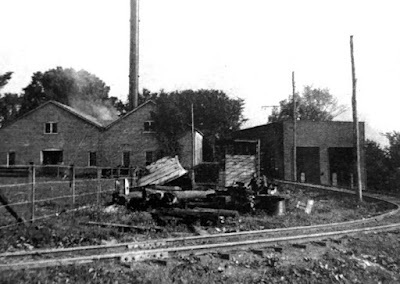 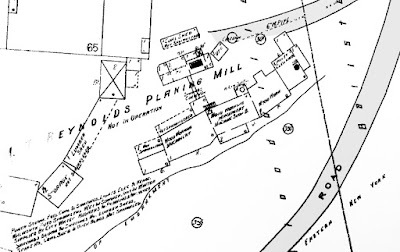 We located both the Planing Mill and the Union Bag and Paper Mill complex. 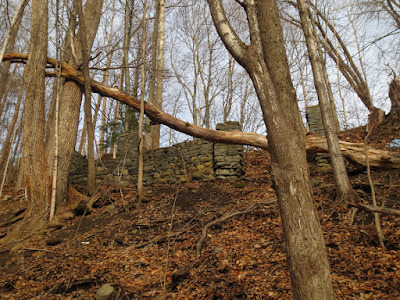 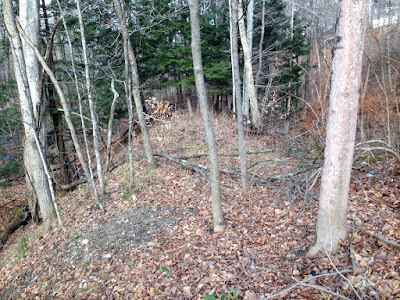 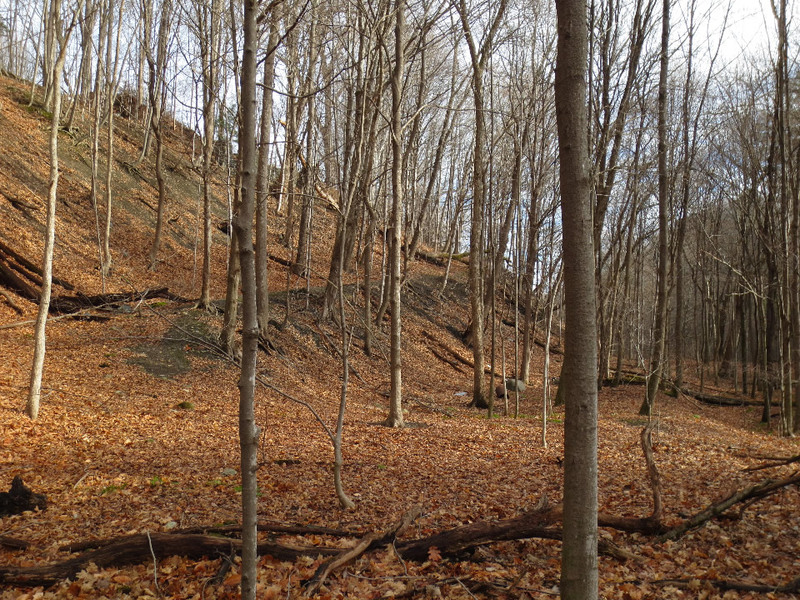 The remnants of the Planing Mill were at the top of the hill. The valuation map helped decipher some of what we found. 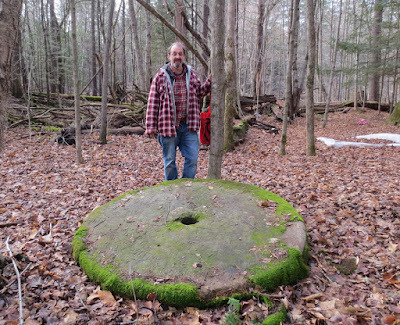 This massive millstone was the coolest discovery! 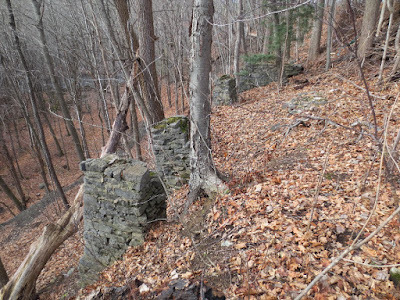 Once again after exploring the ruins, we tried to continue north on the old RR ROW but were unable, so a jaunt a bit further northward in the car brought us to the next spot. 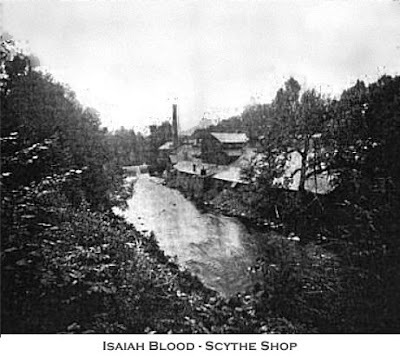 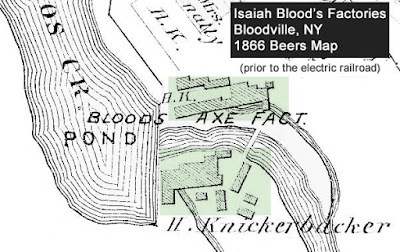 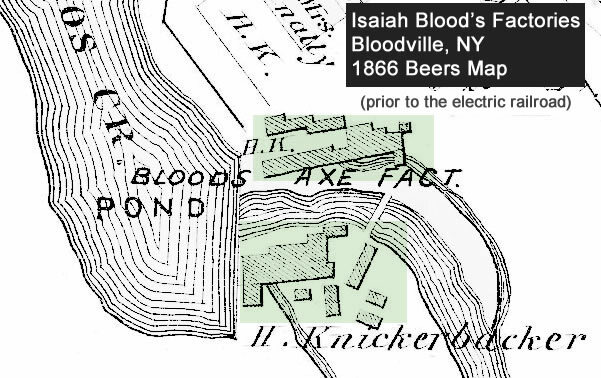 Isaah Blood had built quite an extensive complex that straddled both sides of the river. This location had a tragic fire-plagued history - the last incarnation was Ballston Pulp & Paper. 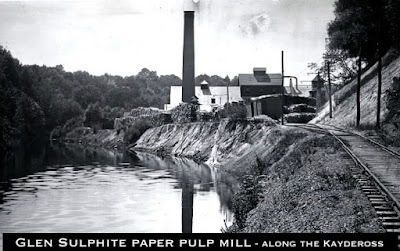 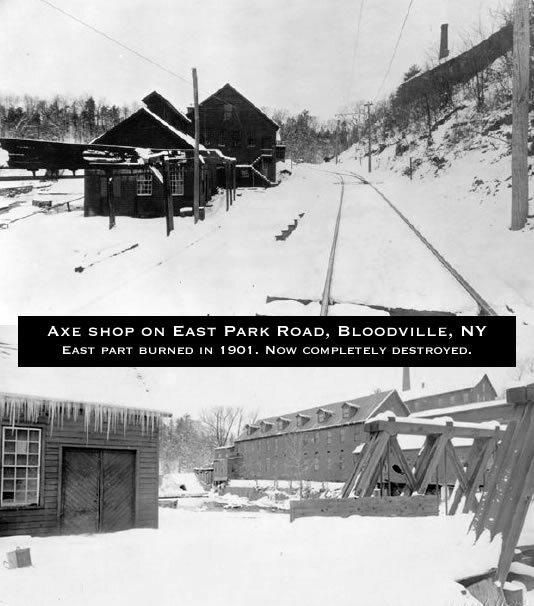 Details in the link "Bloodville - Ballston Pulp & Paper" in the Further Info section below. 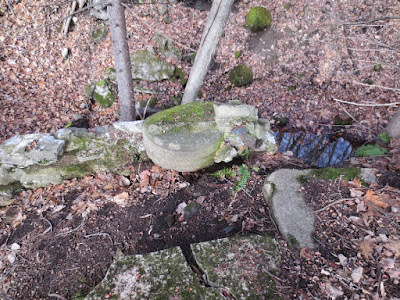 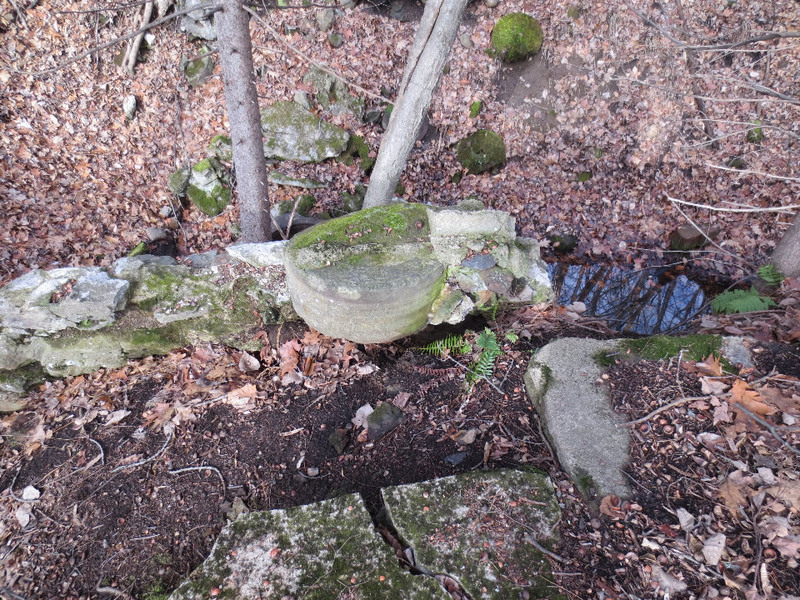 There were quite a few of these circular stones built into the stone walls. 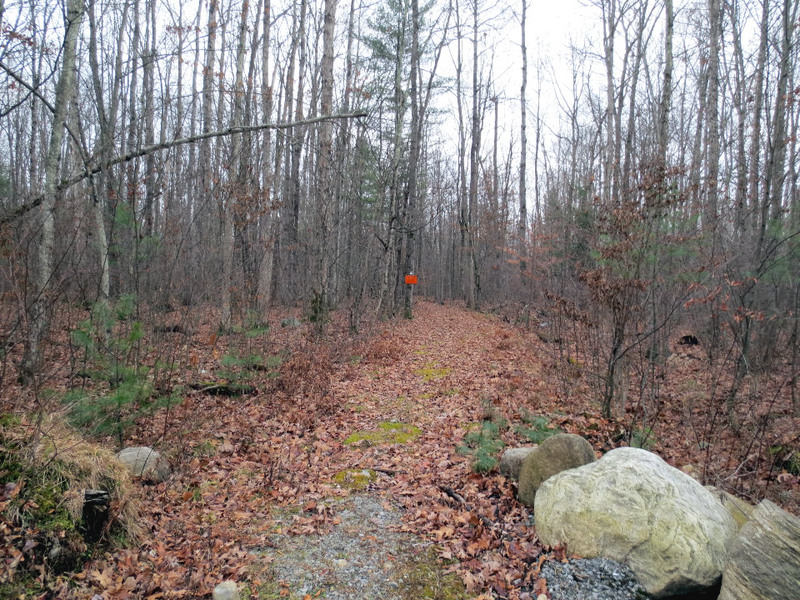 The ROW dead ended going northward so "back to the car!"